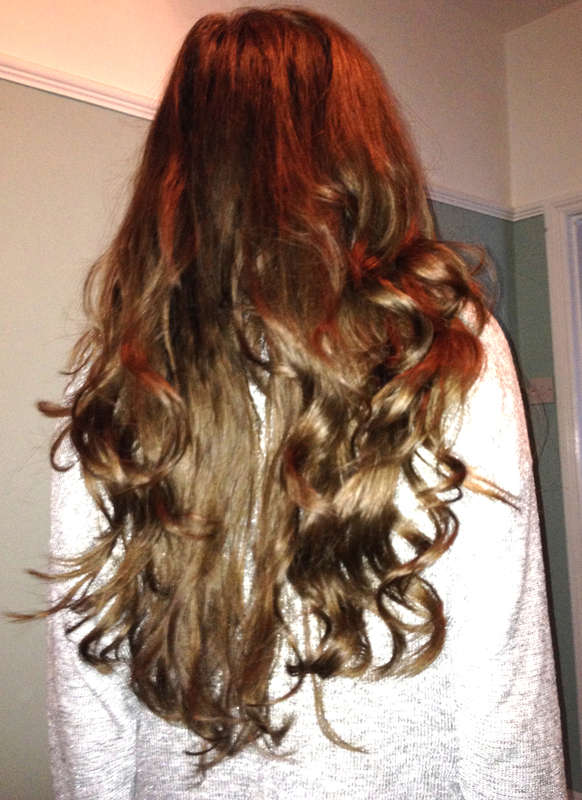 Being a girl with limp, straight hair I really struggle to achieve volume! I recently bought the Charles Worthington Volume & Bounce texturising spray after a recommendation from a friend and am seriously impressed! It gives my hair natural looking volume at the roots and can be sprayed through the ends to add beachy texture. I love it so much i’ve bought the travel size for my bag for touch ups! All I do is wash and dry my hair then spray it into my roots from around 30 cm away and ruffle it up with my fingers for every day volume, but you can use it to help give hair grip for an updo too. I’ve been experimenting a lot over the past few months with different fake tans, some of which left me looking streaky and awful and a select few leaving me with a gorgeous natural looking glow. 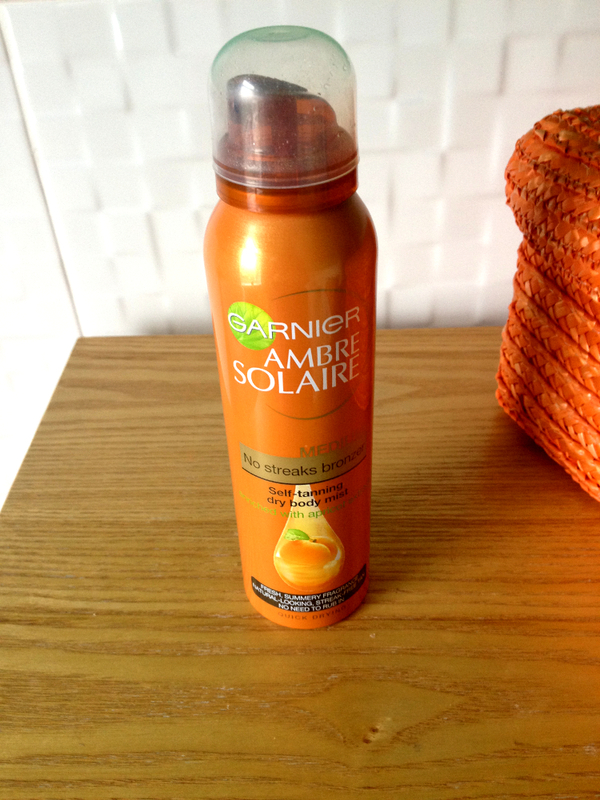 Today i’m going to share with you my top three tanners this summer! I absolutely love this tanner! Read what I think about it here. This is an amazing product! It leaves my skin feeling extremely soft for days and gives a gorgeous, natural looking colour which fades evenly. It also sinks in instantly meaning you can get dressed straight after application without that horrible sticky feeling. I usually apply it around 2-3 times a week to keep it topped up and glowing! 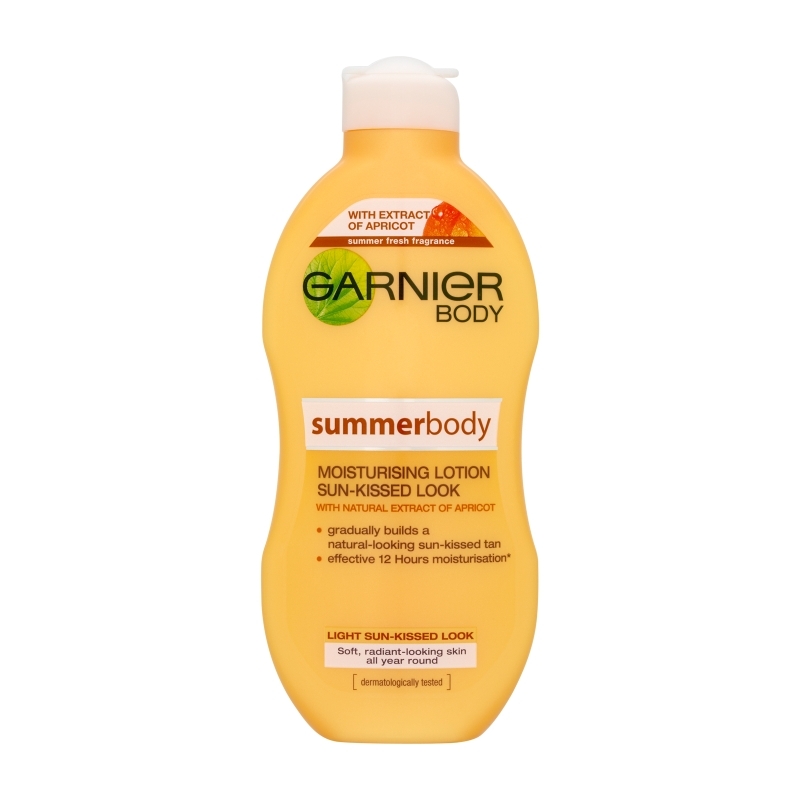 Have you tried any of these self tanners? Benefit Gimme Brow is a tinted brow-volumizing fiber gel. It looks almost like a mini mascara and needs to be applied in gentle strokes until you reach the desired look. Most importantly, it gives an extremely natural looking finish and is quick and easy to use; perfect for when you’re doing your makeup in a hurry. Its also has amazing staying power, I wear it for around 12 hours on average and it does not budge at all! I’ll definitely be repurchasing. It retails at around £18.50 and I wear the shade medium/deep. Have any of you tried it out? If yes, what do you think? Let me start off by telling you how awful I am at applying self tan, I usually end up with patches of orange all over my body with horrendous patchy hands. 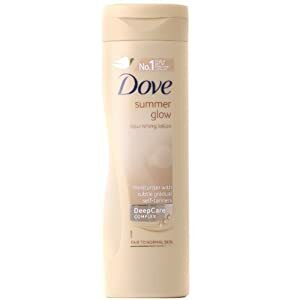 I gave up a while ago and decided to just apply my beloved Dove ‘summer glow’ gradual tanner whenever I wanted a bit of colour. That was until one sunny day while I was sitting in the garden desperately trying to get some sort of colour from the sun, reading the latest Look magazine. There was an interview with Michelle Keegan talking about the tan that she uses, and since she’s always so gorgeous and brown I decided to give it a go. I purchased my bottle from Boots where its reduced at the moment to £7.79 from £11.69. Prior to application I moisturised my whole body with my Soap and Glory ‘The righteous butter’ to ensure that I didn’t have any dry patches and let it sink in. After about 15 minutes I finally applied the dry body mist all over my body, including my face, and let it dry for a few minutes. It felt instantly dry and I didn’t feel sticky at all so I put my pjs straight on and went to bed. The next morning I woke up to bronzed, slightly orange tinted skin but after showering I was left with a gorgeous natural looking even tan. Even my back was perfectly tanned and I really struggled to reach it. I also applied it the next night and was left with an even nicer, deeper colour. I’m now just going to apply it once a week or so to top it up. The only thing That I would say is that it can stain the bottoms of your feet (even if you wipe them after application) and its such a fine mist that it can be so easy to apply too much! I would definitely reccomend giving this self tanner a go if your a beginner or are looking to try out something new. I use the medium shade as I am naturally very pale and thought the dark would be too extreme. Have any of you tried it yet? 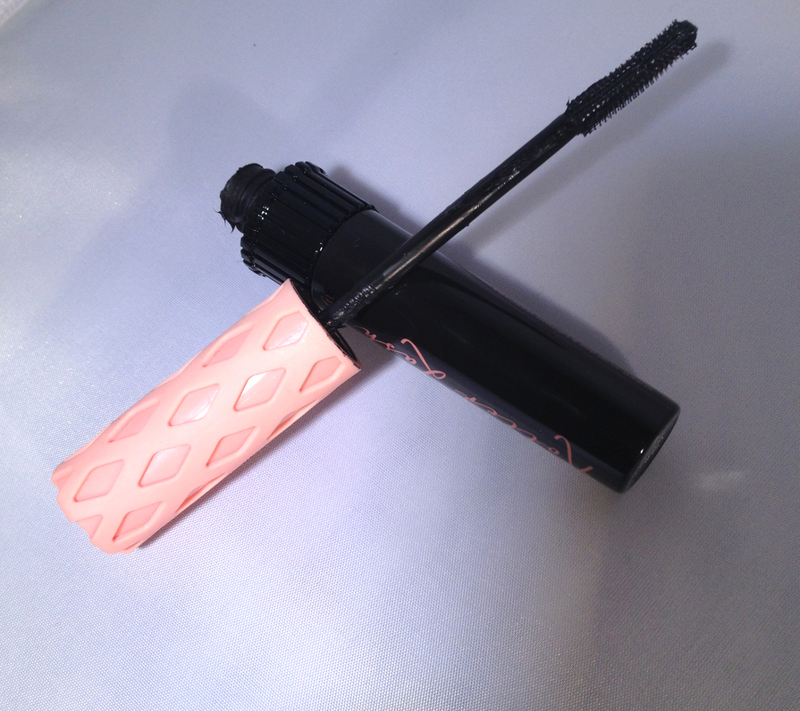 Benefit Roller Lash – Worth The Hype? After writing about this mascara in my ‘Makeup/Skincare Wishlist’ post I decided to finally give it a try! I’ve been using it for the past week and can honestly tell you that it definitely is worth the hype. It curls lashes perfectly, meaning there is absolutely no need for an eyelash curler unless you’re going for a really dramatic look (as seen below). 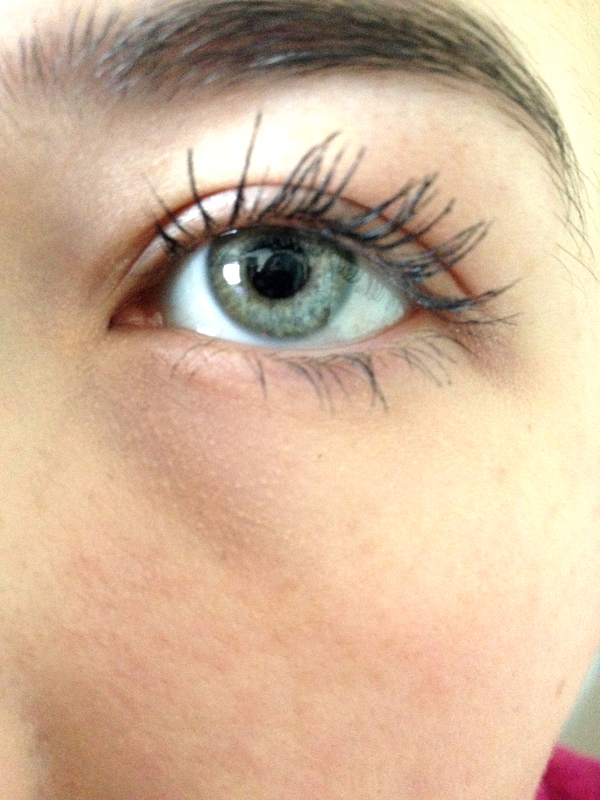 I put two coats on which leaves my lashes looking long and thick – but if you like a more natural look one will suffice. Benefit claim that the Roller Lash mascara works so well due to the ‘Hook n Roll brush’ which is said to grab, separate, lift and curl (using the same idea as hair rollers)…while the instant curve-setting formula holds for 12 hours. I can vouch that it really does last that long; I put my makeup on at 6.30am and when I get home at 6pm this mascara hasn’t budged at all! Perfect for when you need your makeup to last all day. It’s a little more than I would usually pay for a mascara at £19.50 from Boots, but it really does what it claims to and is definitely worth a try if you have limp, hard to curl lashes like I do. 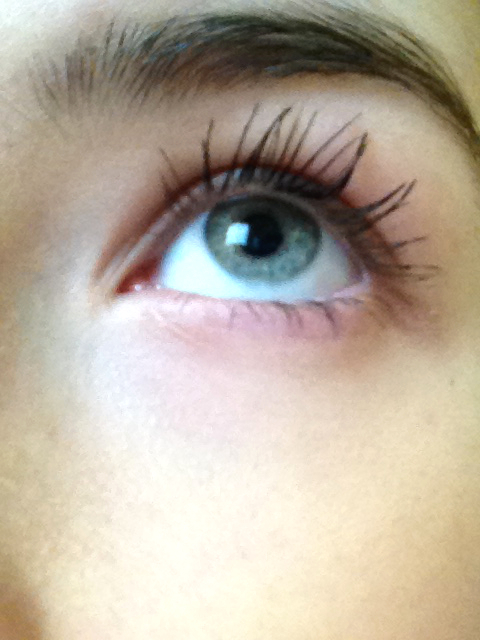 Have any of you tried Benefit’s Roller Lash? I did a haircare routine back in April 2013 but since then most of the products that I used have changed; so I decided to create an updated post informing you how I maintain my long, fine hair. 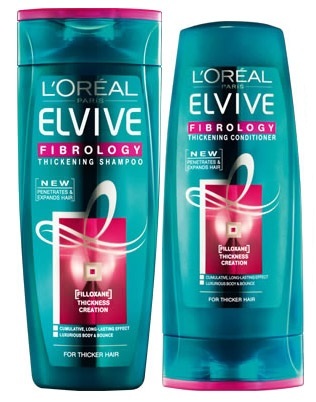 I tend to switch out my shampoo and conditioner quite a lot, but lately i’ve been using the L’Oreal Elvive Fibrology line and I’m loving it! It makes my hair look so much thicker and volumised whilst still feeling smooth and sleek. After running out of my beloved Liz Earle Botanical Shine Nourishing Hair Oil I decided to try out the OGX Renewing Moroccan Argan Oil Penetrating Oil as it is slightly more affordable at £6.99 from Boots. It claims to ‘penetrate the hair shaft restoring shine and softness whilst strengthening’ the hair. I’m not 100% sure about the strengthening part as I’ve only used it for a few weeks, but it does make your hair soft, shiny and manageable without leaving any sort of residue. All is spread a small amount (about the size of a 20p piece) throughout the lengths and ends of my damp hair and then comb it through to distribute. Then when I blow dry my hair it’s left both feeling and looking glorious. I recently started to use the Dove Oxygen Moisture Root Lift Spray to add volume to my roots, read what I think about it here. I use the Avon advance techniques heat protection styler if I’m going to blow dry, straighten or curl my hair, which isn’t very often. This spray is light, affordable and smells lovely which is always a bonus. 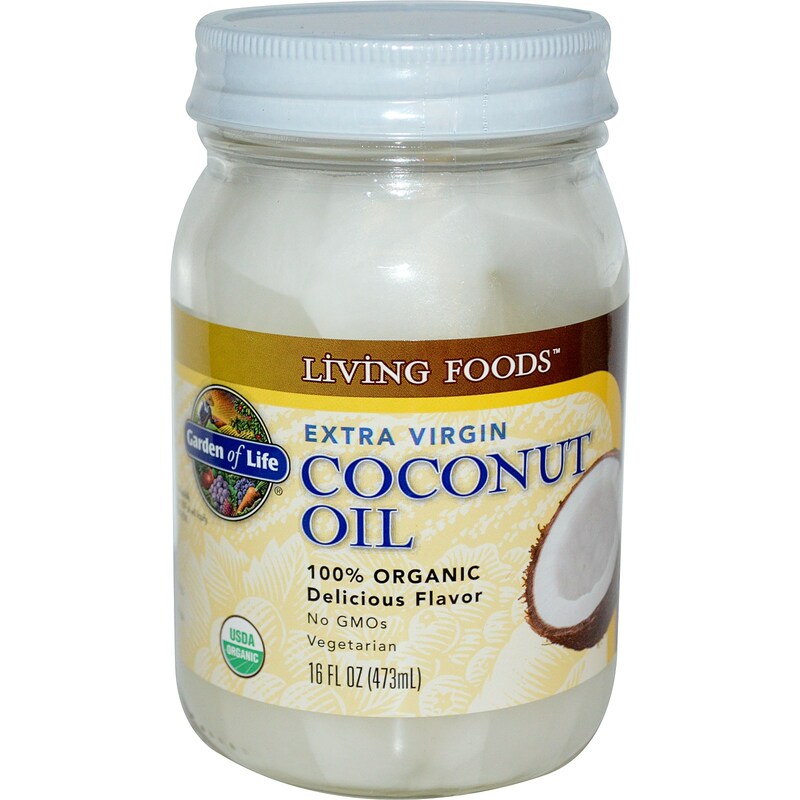 I use coconut oil weekly to help keep my hair and scalp healthy. Read about how I use it here. As for brushes I’m still using my tangle teezer which you can read about in my last haircare routine post. I also use a wide tooth comb when my hair is wet to avoid any unnecessary breakage. Cut down on washing your hair. I’ve got extremely fine hair and I found this step hard when I was growing out my hair as I always felt like my hair looked so greasy on the second day! Just use some dry shampoo (batiste is my favourite) and try and make the time between washing longer, after a few weeks you’ll start to notice that your hair doesn’t look as greasy on the days after washing and you’ll notice huge amounts of hair growth after a couple of months, trust me! I only wash my hair twice a week now and it has never been so long and healthy. Do coconut oil hair masks. Coconut oil is absolutely amazing for your hair, saturate both your scalp and ends in it, cover with a shower cap and sleep on it. Yes you’ll look crazy but it’s honestly worth it! When you wake up, shampoo your hair twice and it will be left feeling like silk. It will also help with growth as it’s keeping your scalp healthy too. Stop using hot tools! Using straighteners or curlers on your hair daily makes it brittle and more likely to break, meaning your goal of long hair will never be achieved. I’m not saying never use them, just try and cut it down to once or twice a week. As a girl with extremely fine, long hair I always struggle to keep volume at the roots. I’ve tried numerous products claiming to help hold my hair and stop it falling flat, but instead I was left with crispy looking, limp hair. I had honestly given up and was either just embracing the lack of volume – or just tying my hair up until I could get some of the length chopped off. Then I saw the advert for Dove’s oxygen moisture line on the TV and was intrigued – what difference does the oxygen make? I decided to give it a go and bought a bottle when I was in Boots a few weeks ago and I couldn’t believe the results! I sprayed it all through my roots, massaged it in then brushed through my hair to disperse it. On this particular day I didn’t blow dry my hair and it still worked! I could see instantly that my hair just looked thicker and my roots looked lifted – and best of all my hair didn’t feel like I had put any products in it at all! Since then I’ve used it and blow dried my hair after – and the results are even better. It lasts until the next wash too which is great if you choose not to wash your hair everyday, as it stays lifted so your hair doesn’t look as flat or greasy. 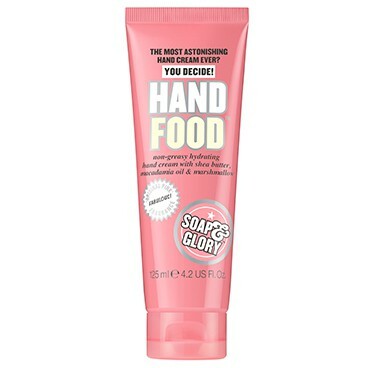 For £6.99 I would definitely give it a go and see how it works for you! 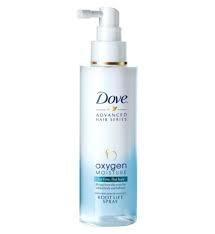 Have any of you tried the Dove oxygen moisture root lifting spray? I received these rollers as a Christmas gift two years ago and never really used them as I wasn’t sure how, I was also a bit worried they would be difficult to use and leave my hair looking a hot mess. A few weeks ago I decided I was going to give them a proper chance and looked at some tutorials on Youtube. Since then I’ve been using them constantly! They’re extremely easy to use and leave gorgeous curls that lasts for days (or until the next wash). All you need to do is section your hair and put the curlers in, directing them away from your face, I tend to use the larger rollers on the top half of my hair to add volume and the smaller ones on the bottom as this is where I’d like the most curls. Then all you need is a touch of hairspray and you should be left with soft voluminous curls – perfect for any occasion. The only issue I have is that they take a good half an hour to heat up – which isn’t great if your short on time. However, as long as your prepared, you shouldn’t have an issue with this. 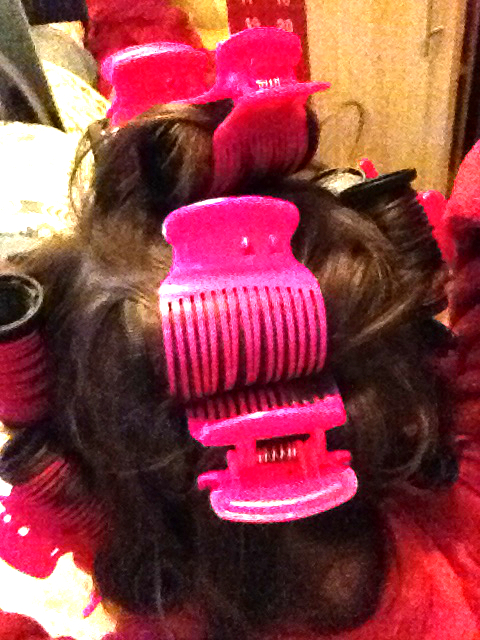 Sorry about this awful quality photo – but this shows the rollers going towards the back of my head. 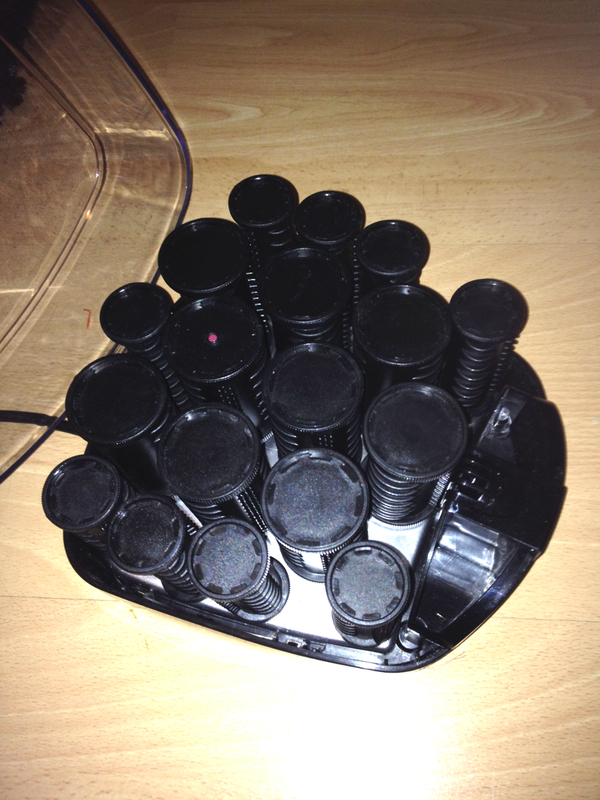 Have any of you tried these hot rollers?